As a game designer I use the little chaps all the time – even the odd ones with more than the traditional number of sides. I’m not biased against any regular¹ polyhedron (they all have their place in the gaming world) even though I often find D6s easier to get accepted. My desk usually has a variety of them scudding about and they turn up round the house in the oddest corners – often persuaded into them by one of the cats. They are a tool I use for my work, and though it’s fun to have specific sets for an army or a game they’re really just part of the furniture. The other day I got my hands on some of the new DreadBall dice from Mantic. They’ve done a set for each of the first 4 teams, plus one with the DreadBall logo. Now I normally wouldn’t bother with reviewing dice, but these have really put a smile on my face. I know, très geeky, but there you go. The photos tell you more about what they look like than words, but it’s worth mentioning that Mantic have gone for the more expensive (and infinitely better) option of engraving the symbols rather than printing them on. I’ve had various printed dice in the past and they never last long. It’s always the poorer option. 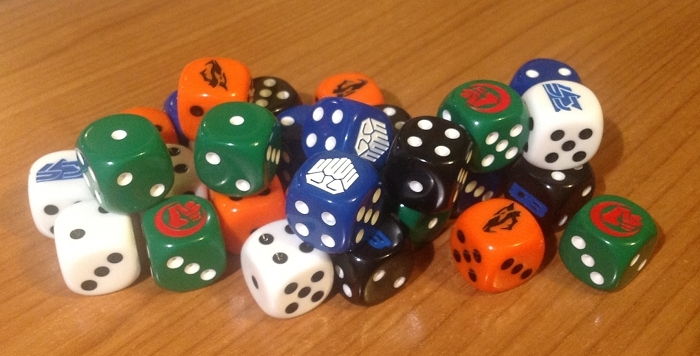 Each dice set has an appropriate combination of colours, based on the official team strips. The dice are 16mm and have a nice heft. In fact, it’s really the feel of them in my hand that makes me like them so much. That and the fact that my Orc team killed four of the other side last time they had an outing. There’s not much more to say about dice really, other than they feel good, roll happily and look great. They are nicely made and will last well (because they’re engraved). I’ve got dice that I’ve used for 30 years and I see no reason these shouldn’t serve the same term, as long as the cats don’t get them first. I expect I’ll have to bequeath them to someone in my will. 1: or even irregular ones if I could find a use for them. This entry was posted in DreadBall - The Futuristic Sports Game, Review. Bookmark the permalink. I like the looks of the dice and I might have ordered a set if the Skittersneak colors were yellow and black versus orange and black. I thought that the orange was a bit brash too until I went to look at some American “football” college team colours, when it suddenly seems quite muted by comparison. Yeah…. University of Maryland and Oregon are both major offenders of ugly uniform code! The only problem with them is their limited audience. I don’t know anyone who plays an ‘official’ DB team, so the little emblems and such won’t match the DIY emblems. I could be wrong, but I’d be surprised if these make any real money for Mantic. They’re not really intended as major earners. More as a bit of fun. It’s obviously not practical to make them in every possible colour combination. Indeed it is the thought that counts, and I certainly salute their attitute 🙂 Maybe Mantic could go one step further and get into bed with one of the UK dice companies and provide custom dice to order? From the pricings I’ve seen this would be insanely costly and not very popular. Getting quality dice etched rather than printed is not a cheap option, which is why you often see printed ones. Custom dice are worth it from 200 dice or more. We made custom for our BB league, and the cost was fine. Some people made their custom dice but they gave them as presents. Making a few is just to costly. Yup. If you’re talking multiple hundreds then that’s feasible.